The two rovers on Mars are on the move. Spirit, after 10-day lapse in memory, now functions again after efforts by Jet Propulsion Lab (JPL) scientists. Its twin explorer, Opportunity, has been traveling in its own crater, halfway around the planet. The first drill hole on Mars, shown here in process, is more of a shallow depression, made by the rover Spirit's rock abrasion tool. The ground spot is 45.5 millimeters (1.8 inches) in diameter and 2.65 millimeters (0.1 inch) deep, made Feb. 6, 2004. Image courtesy of NASA/JPL/Cornell. Closer inspection by Opportunity of a rock in its home crater revealed bedded sand layers containing tiny rounded nodules. 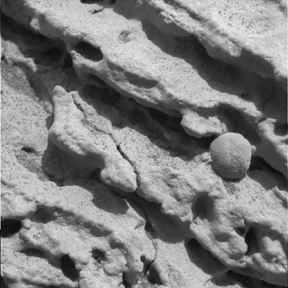 JPL scientists have hypothesized that these nodules could be concretions from water flowing through the sediments and depositing minerals. Alternatively, they may be volcanic "teardrops" that were pyroclastically distributed and now float in the sand grain matrix. Earlier, Opportunity saw similar rounded pebbles in soil near its landing site. Its first images of the soil also indicated hematite-rich soil at the surface, a possible indication of the presence of water (click here for images below). Opportunity detected the hematite using its thermal emissions spectrometer, one way it has of "seeing" Mars' surface. But how the rovers "see" color is different than humans do. The rovers' cameras capture the martian surface in black and white. It is the scientists back home who assign color values to the images for the world to see in "true color." Of the 11 lenses on the rovers' panoramic cameras, three are dedicated to red, green and blue wavelengths. The rest record reflections from surfaces at different wavelength ranges, in order to find different reflectance properties (for example, olivine and pyroxene absorb light at the one-micrometer wavelength because of their iron content). The filters, set on the two adjacent lenses of the camera, range from the 450- to 980-nanometer wavelengths. Two of the lenses are dedicated to watching the Sun, and one is clear. The camera sits about 1.3 meters above the ground, for a human's eye view, and it can send back image swaths that are 1024 by 1024 pixels. The rovers send their photos back in pixel batches, which are sometimes garbled. Back on Earth, computers overlay and correct the red, green and blue lens views, according to the original color chips that Cornell scientists placed on the rovers, in order to approximate landscape images as a human eye might see them. Despite the flood of new sightings and findings, the rovers still have a way to go. Yesterday, NASA announced that the Spirit demonstrated it could navigate on its own, using software that programs it to avoid obstacles and direct towards a specified goal. The rover moved almost half a dozen meters, while Opportunity negotiated a little more than 4 meters of its home crater's rim, shooting pictures as it rolled. That distance may not seem like much, but it will take weeks for the rovers to traverse the Mars landscape in order to reach their study targets, some of which may only be meters away. A magnified image taken of soil near the Opportunity's landing site, Meridiani Planum. 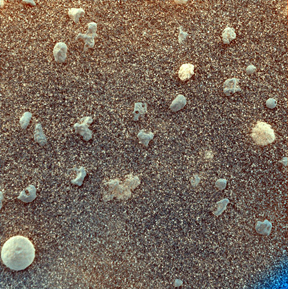 Coarse grains on the scale of millimeters rest on fine sand; the image is 3 centimeters (1.2 inches) across. These pebbles may be cooled lava droplets or accreted nodules. Image courtesy of NASA/JPL/US Geological Survey. 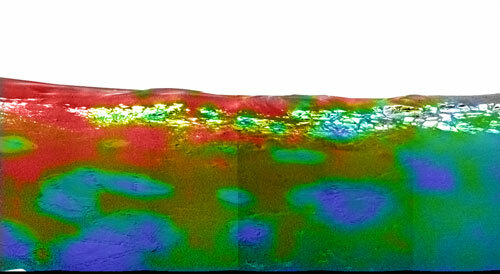 Opportunity used its thermal emissions spectrometer to detect concentrations of crystalline hematite, which is high in the red and orange and low in the blue and green patches. 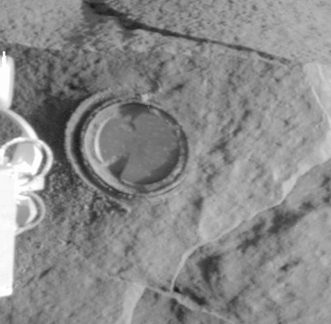 The lander's airbag left bounce marks that lacked hematite. Image courtesy of NASA/JPL/Arizona State University/Cornell.